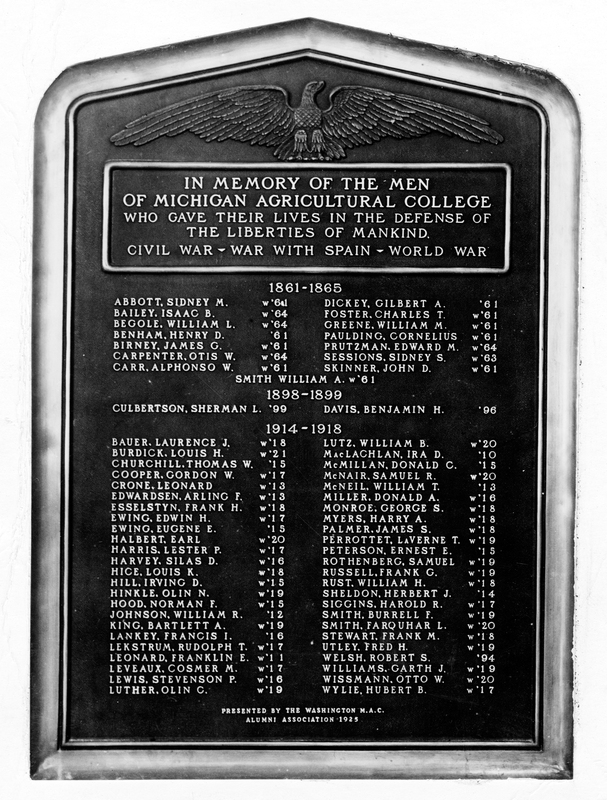 The War Memorial at MSU is housed in the Union, and it was presented by the Washington M.A.C. Alumni Association in 1925. 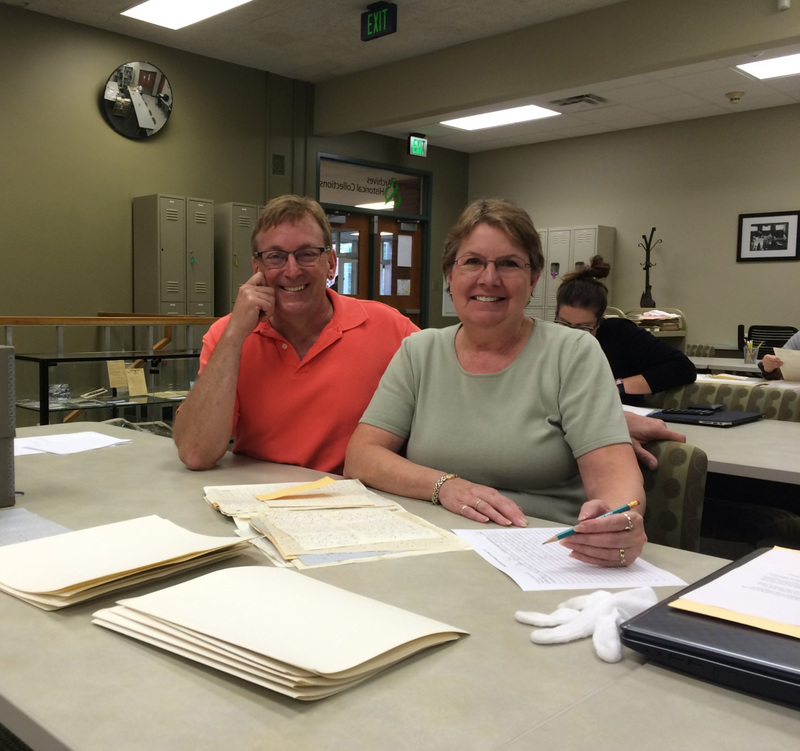 As part of MSU’s effort to commemorate the 150thanniversary of the US Civil War, an immense project has been underway at the Archives for the last two years and has finally been revealed to the public. Tributes for the Sesquicentennial began around the country in 2011, but just recently in early October 2012 the new Civil War Collections website for the University Archives went online, showcasing hundreds of pages of the correspondence, diaries, musters, reminiscences, and photographs that have survived one of the most hard-fought wars on American soil. In all, the various records range from being only a few pages long to multiple boxes in size, and they are contained in over 120 collections. The process to digitize these materials has been a long-running and painstaking one, and it’s not over. Every document on the site has to be transcribed word for word so that researchers or enthusiasts can read perfect text copies of the image they are viewing, which were often written in nearly illegible cursive. 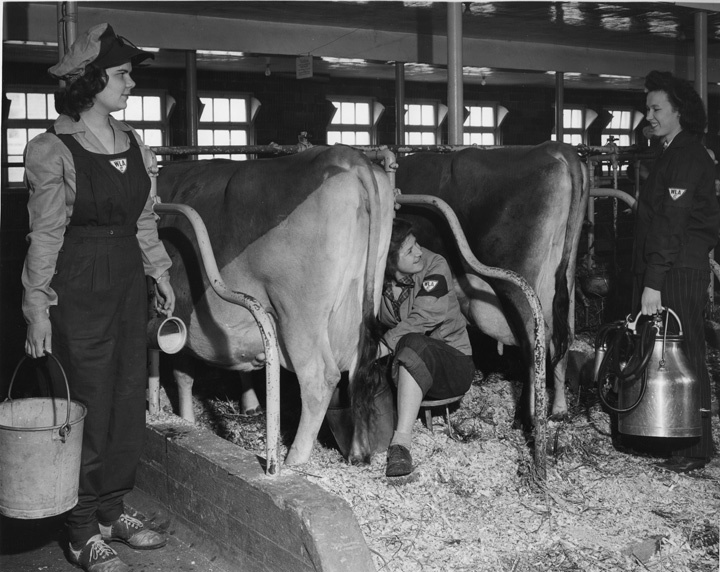 In addition, each photograph has to be scanned and catalogued, often involving the complete disassembly of a scrapbook, or in-depth research to place an item in context. The result is an ever-evolving website which offers academics ample access to, and a clear view of, many primary Civil War resources. Two news articles have been written about the archival process itself as well as the opening of the website, one of which was published by MSU news and one by the Flint-area station, ABC-12. 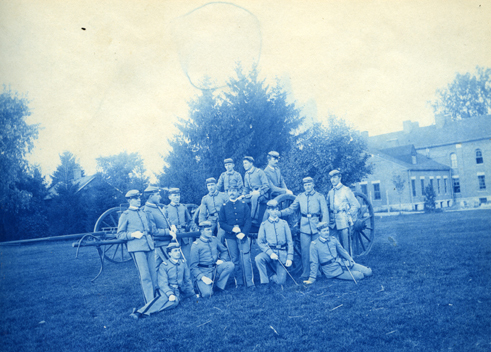 This photograph shows the original seven graduates from MAC, who left before their commencement to fight in the war. 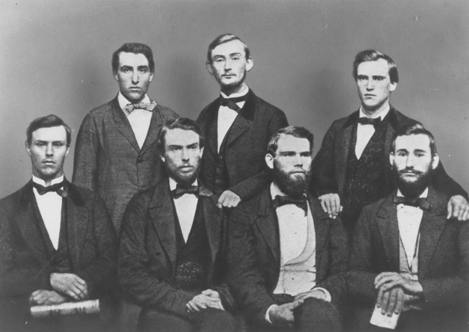 From left to right are: (top) Larned Vernal Beebe, Gilbert A. Dickey, Adams Bayley (bottom) Henry D. Benham, Albert Nelson Prentiss, Albert Fuller Allen, and Charles Edward Hollister. Despite no actual battles occurring in this state, Michigan and her soldiers were crucial to the Union war effort—President Abraham Lincoln is known to have yelled, “Thank God for Michigan!” when the state’s soldiers reported for duty. They served in the infantry, cavalry, artillery, and as engineers for more than 50 regiments, and more than a few Michigan women also joined the effort, including the well-known nurse Annie Etheridge. MAC itself was directly involved: the first student to volunteer was a junior by the name of Samuel Alexander in spring 1861, followed the next autumn by the entire first graduating class of seven young men. The remaining students began to be formally instructed on various aspects of military training, even receiving sixty muskets from the state for further training. To see additional information and a detailed list of MSU’s collections pertaining to the Civil War, click here. 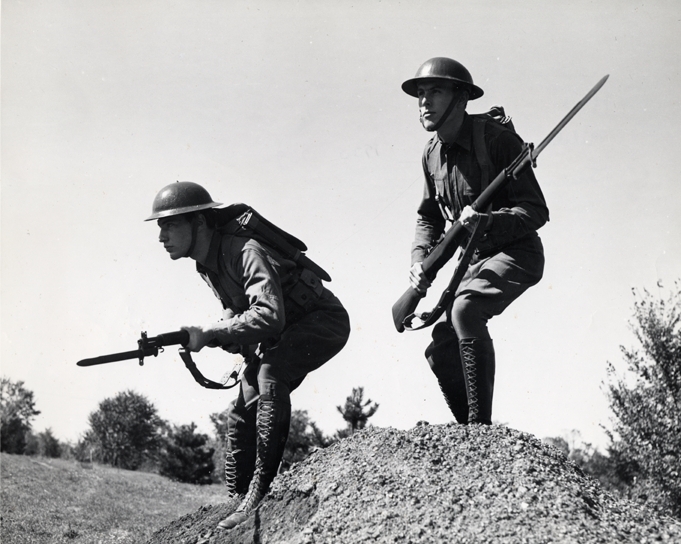 The University Archives & Historical Collections teamed up with the MSU Library and the MSU Museum for a joint exhibit to commemorate Michigan’s role in the Civil War. The exhibit is located on the 4th West floor of the MSU Library and was arranged by Portia Vescio and Anita Ezzo. The exhibit contains books from the library collections, letters and photographs from the University Archives, and artifacts from the Museum. Some topics covered in the exhibit include recruiting and training, the hard life of a soldier, medicine, and battles. The exhibit will be up through most of the fall semester. In 2011, the nation began commemorating the 150th anniversary of the Civil War. As part of this sesquicentennial commemoration, University Archives & Historical Collections staff are transcribing and digitizing its collections relating to the Civil War. 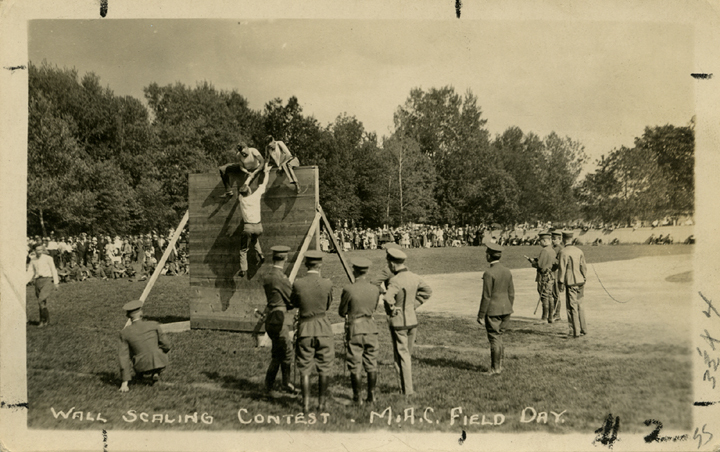 These materials—including hundreds of pages of correspondence, diaries, musters, reminiscences, and photographs—will be made available online for public use. To find out more about these collections and other online exhibits, please visit our Civil War page.